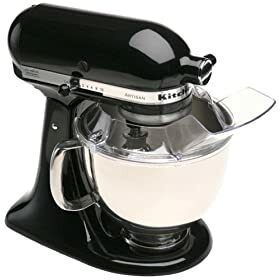 KitchenAid’s Artisan stand mixer is a substantial piece of equipment: 325 watts of mixing power make child’s play of creaming butter, kneading dough, and whipping cream. The kid in you will appreciate how quick and easy it is to mix up a batch of cookie dough. This model comes with three attachments: a flat beater for making batter, meat loaf, and all textures in-between; a wire whip for egg whites, mayonnaise, and more air-infused creations; and a hook for mixing and kneading yeast doughs. All three are solidly constructed and easily secured to the beater shaft with a simple twist.